Dealing with Rashes can be excruciating. Hot, cold, nothing seems to soothe. Nature's Rite has put together an herbal solution that is the greatest natural support system. You need to try some time-tested natural herbs to quell that rash and support healing of the skin. You have discomfort, swelling, redness, flaking, etc – all of these on one patch of skin can be a bit more than a nuisance. So what are you to do…. cover it with lotion? Use some steroid or another to try to keep it down? Neither one is a good idea; the former is not effective, and the latter has proven to be pretty risky. You’re going to need some defenses that are not to be trifled with. Herbs are the main ingredients, and there are lots of them to take care of the issue. It’s the most complicated mixture that Nature’s Rite offers. Calendula, Aloe Vera, and Comfrey are traditionally used to support healthy skin recovery. There are a lot of herbs there, but rest assured that our company has tons of expertise in making safe, effective herbal solutions. I have been trying everything for about a year now, and the usual allopathic treatments have been largely useless, not to mention expensive. 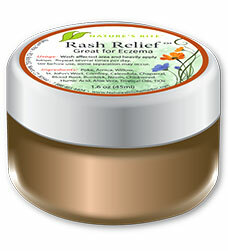 Finally came across Rash Relief™ and ordered some jars. All I can say is Thank you! — David Fawcett, Claremont, CA.